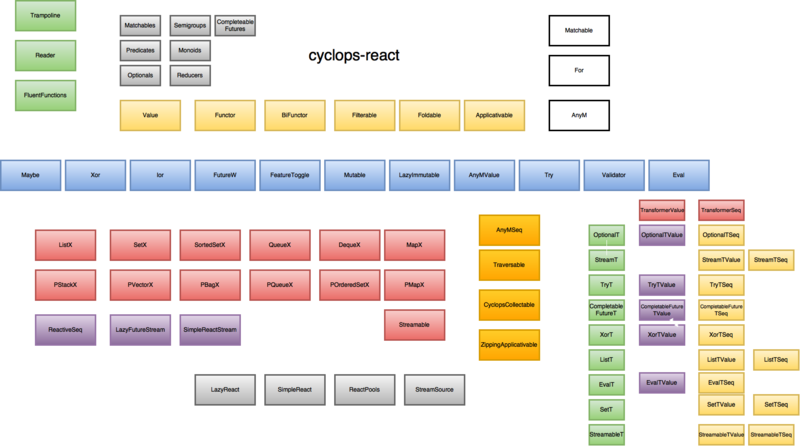 cyclops-react provides advanced sequential and multi-threaded streaming, functional control structures & collection extensions. Watch the related screencast 'Reactive Programming at Scale' in which Paul Downey a Technical Director of engineering at AOL Platforms, and John McClean author of cyclops-react explain how cyclops-react was used in building the indexing component of AOL Platforms demand side forecasting platform. Sebastian Millies wanted to implement an algorithm for deterministic and non-deterministic finite state machines as describe by Mike MacHenry in Java. cyclops-react provided abstractions to make it possible to convert a very high-level Haskell algorithm to plain old Java. A user wanted to program in Scala style as described in The Neophytes Guide to Scala using Javaslang and cyclops-react, by leveraging the cyclops-Javaslang module and powerful cyclops-react for-comprehensions the user was able convert an advanced Scala style of programming to easy to understand Java as is.